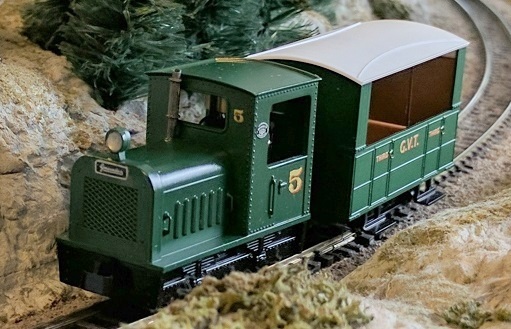 MinitrainS has come back in a Big Way with new HOn30 models. The new models are very well done and run much better than the old Minitrains models. The product line is much broader than the old Minitrains line and new models are released every year. Please note that these models are made in small production runs, so models may go out of stock for a while. 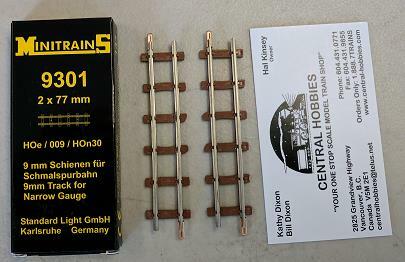 We are slowly increasing our store stock of MinitrainS items. We can order any available models for you. The Status column indicates if the product is available from the US distributor. Please feel free to contact us if you have any questions, or you wish to order an item or three. Please see the bottom of the page for notes on Pricing and shipping. Some of the MinitrainS we have in stock. The MinitrainS shelf from the other end. 2018 Limited Edition item shown at the 2018 Nurnberg Toy Fair. 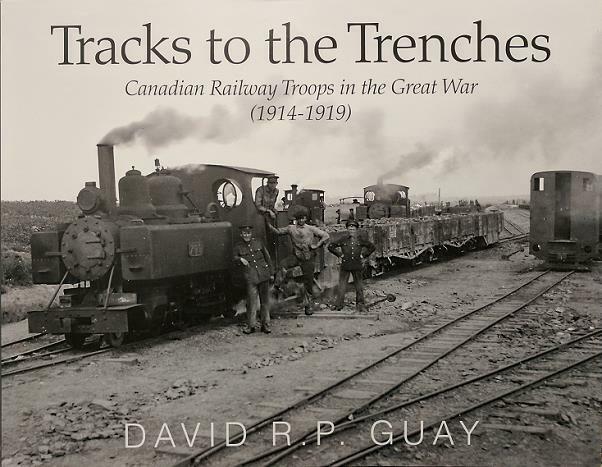 Tracks to the Trenches This book about Canadian Railway Troops in the Great War (1914-1919) has many images of these and other WW I era locomotives in service with the Canadian Railway Troops in WW I. Currently out of stock. New stock expected in the next month or two (Feb-Mar 2018). The Black MinitrainS Bagnall with a string of Peco Glynn Valley four-wheel cars. The Maroon MinitrainS Bagnall with a string of Peco Glynn Valley four-wheel cars. Customer Comforts on Fiddletown & Copperopolis Passenger trains were rudimentary. The Fiddletown & Copperopolis Passenger Trains needed a dining car. MinitrainS Bagnal with Tipper Cars on MinitrainS Track. This undecorated Gmeinder was custom painted to pull my Peco Glynn Valley Tramway Cars. It will serve until I get a Peco Tramway Locomotive kit (GL-6) assembled. The MinitrainS # 9000 Controller with pulse wave modultion works very well. It handled all MinitrainS locomotives, a Bachmann Skarloey and a Life- Like Mavis conversion. $0.00 CDN Displayed or Announced but not yet available. New items for 2019. Delivery May 2019. Price estimated to be around $ 200 Cdn$. New items for 2019. Truck based 4 wheel wagons with or without brakes. 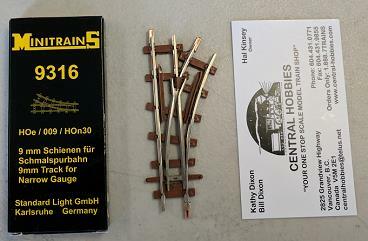 As a real Narrow Gauge Track System with a small radius was not available MinitrainS decided to create one. Their new track system comes with a 140 mm ( app. 5,5 inch) radius curves and thus allows building layouts even on a bookshelf. 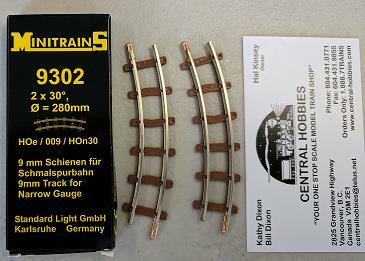 The track profile is CODE 83 (2.1 mm). Please be aware that the small radius allows only to run shorter locomotives on it. The MinitrainS Heeresfeldbahn 0- 8-0 locos run on it, but the attached coaches will be pulled off the track. For the larger locos the best is to use the PECO track. If there is enough demand MinitrainS will develop a larger radius solution. There is a downloadable planning sheet on the MinitrainS web site. 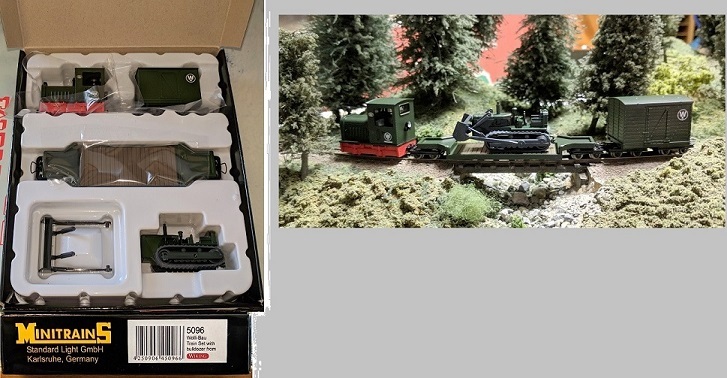 This is a limited production Item Only Available Direct from MinitrainS. Minitrains 9301 Track pieces shown with a standard buisness card to give you an idea of the size of the piece. Minitrains 9302 Track pieces shown with a standard business card to give you an idea of the size of the piece. 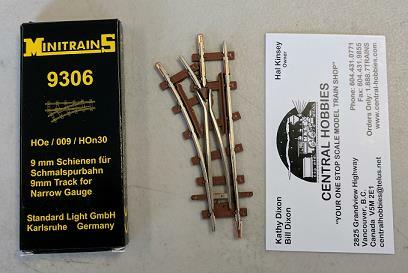 Minitrains 9306 Track pieces shown with a standard business card to give you an idea of the size of the piece. Minitrains 9316 Track piece shown with a standard business card to give you an idea of the size of the piece. Minitrains 9321 Track pieces shown with a standard business card to give you an idea of the size of the piece. 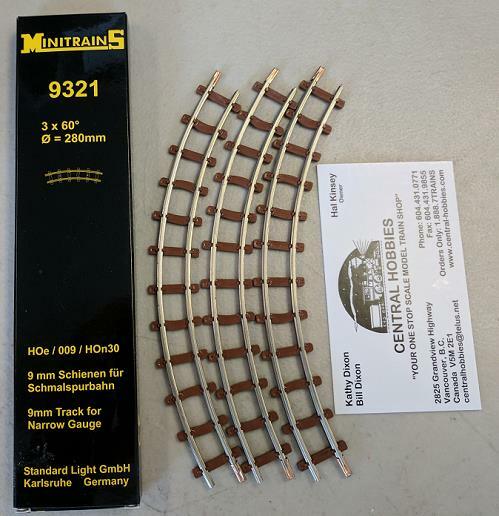 The MinitrainS track is a very sharp radius (5 1/2" Radius). If you need broader radius curves the Peco 00-9 Setrack is 9" radius. For a broader radius than that you can use Peco 00-9 Streamline Turnouts and Flex track, either their Irregular sleeper type (matches their Setrack) or their Mainline Sleeper Type (matches their Streamline turnouts). Please note that all prices are in Canadian Dollars. The Canadian price is set by the US-to-Canadian exchange rate on the day we import the products into Canada. As the US-to-Canadian $ exchange rate fluctuates constantly, the current US price will depend on the day the item is purchased. US orders are shipped Fridays by US Post. Shipping charges will be what ever US Post wants to mail the package to you from Washington State. Canadian orders will be shipped by Canada Post unless you wish to pay for a different method. Images by me unless otherwise noted. As MinitrainS does not like other people using their images, we are in the process of making our own. As we can only photograph models we have seen, many items do not have an image yet. This is a work in progress.